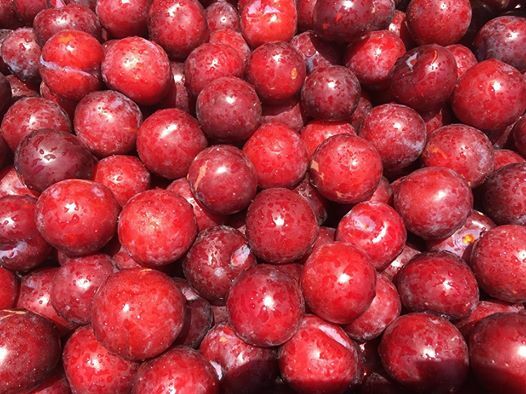 With my eye out for colour on my walk in town, I can’t miss the shiny red plums, warm orange apricots and tiny yellow apples on offer from the young men deftly pushing their full shopping trolleys through the crowds in Pritchard Street. These mobile entrepreneurs have to keep one eye on potential customers and the other on the patrolling cops who could take their trade away. With bottles of water they spray their wares, giving the fresh fruit an appetising look I want to capture. I ask one of the men if I can take a photo of his load of plums and although a bit surprised by my request he agrees. After I’ve taken my photo he counts out the plums I’ve ordered and with a “there you go ma” throws in a few extra before moving on to the next group of shoppers. Touched by his generosity I enjoy one of the ripe plums while walking back in the direction of Newtown. Passing the white Jumah Mosque in Kerk Street, I see an old bearded man in a bright red shirt sitting in the disused side entrance. We greet one another and when he asks if I have any food to share, I spontaneously hand over my bag of plums. He looks in the bag and from his face and thanks I understand he enjoys plums as much as I do. I move on and waiting for the lights to turn green to cross Pixley Ka Seme, I notice some women with small children begging on the pavement on the long side of the mosque and I wish that I had some more plums to give. And right at that moment the man in the red shirt appears at my side. He points to the bag of plums and then to the women: “I’m sharing with the ladies,” he tells me. And off he goes to do so.